« Again, with the Iditarod! Can’t get enough! Once upon a time, and as I have mentioned a few times throughout my previous blogs, we decided to go on a big long roadtrip – the furthest we’d ever driven one way! From Calgary to Halifax, Nova Scotia, but primarily through the United States. The problem with roadtrips is backtracking…in my opinion… The roadtrip is really fun and exciting the entire time, UNTIL it’s time to come home, and then I just want to be home. Instantly. So, we decided to by a “disposable” car. It was 1984 Ford Marquis, purchased for $400. 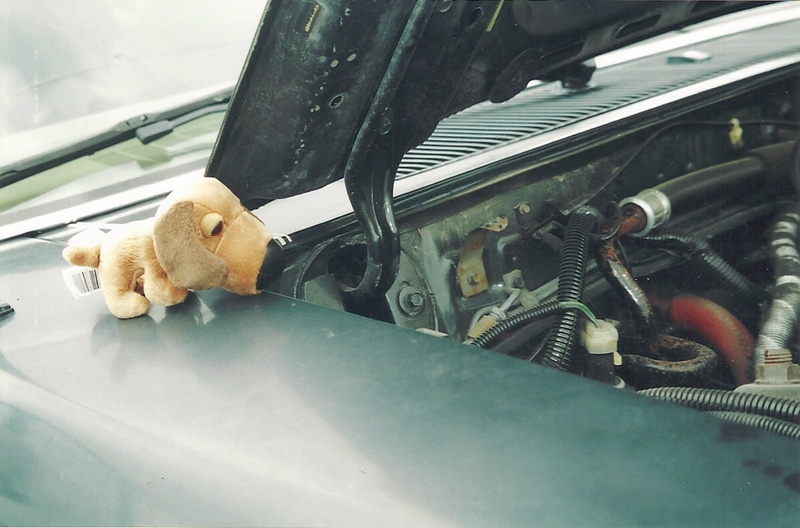 It was SO comfortable – it passed inspection – perfect! Our plan was to drive it one way, and, if it made it in a decent shape, donate it once we were ready to come home, and then fly home. It was mostly a great plan! The only downfall was that the inspection we had done was “inner-city”, so when the mechanics drove it, it never made it over 50 kms (30 miles) per hour. It turns out that at about 50 MILES per hour (80 kms), it started spewing transmission fluid. We didn’t know that until we “died” in Great Falls, Montana. Well, on the side of the road going into Great Falls. 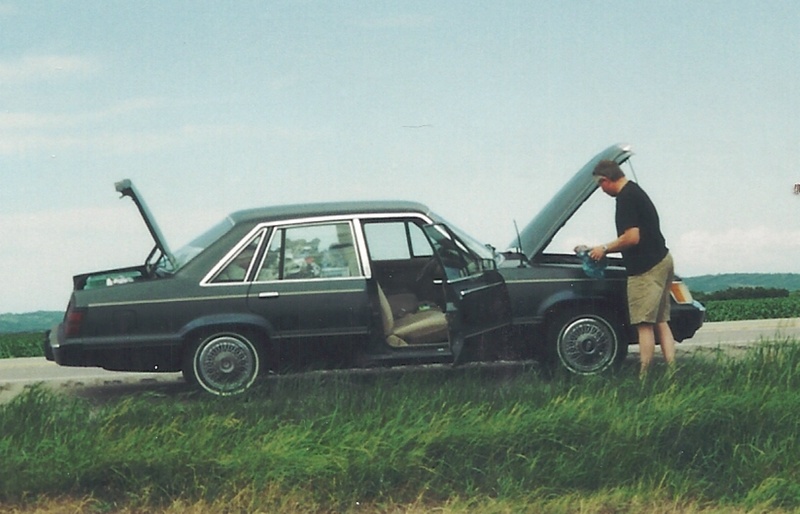 Once we got the car going again (and by “we”, I mean “Peter), we loaded the entire trunk with transmission fluid. 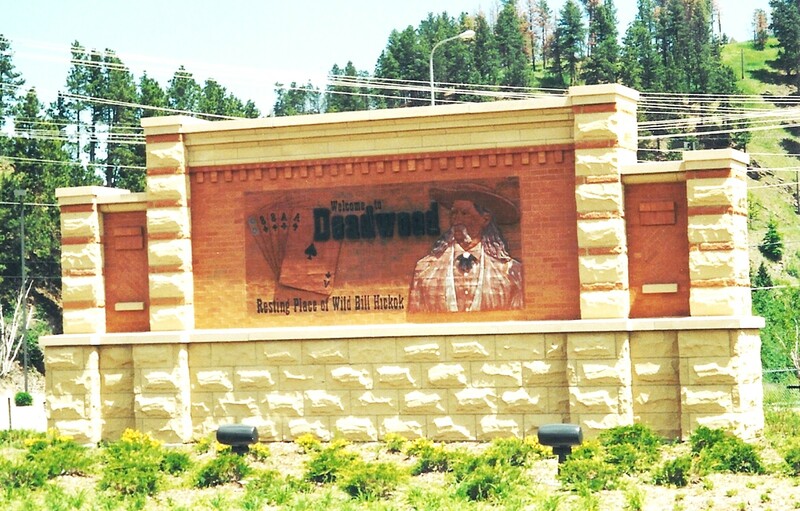 The first few days, we visited some of the places that we later repeated, and I’ve already written about: The Battle of Little Bighorn, Devils Tower, Crazy Horse Monument, and Mount Rushmore. 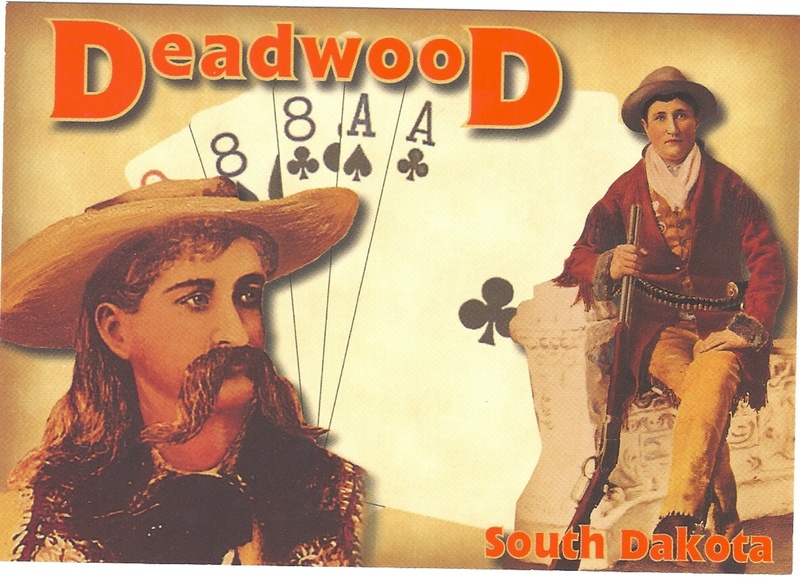 Deadwood sprang up practically overnight and was notorious for gambling, prostitution and murder ~ there’s a reason there’s a movie made about it (I didn’t see it). Wild Bill served in the Civil War, and followed that career with a lot of other gun-fighting endeavors. 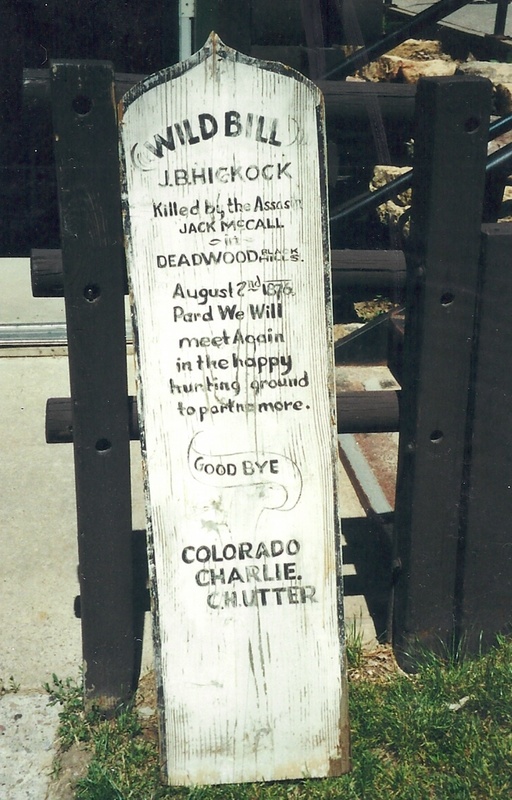 (Apparently, he even scouted for George Custer’s army…) Eventually, he “settled down” in Deadwood, which, turns out, was a bad idea. 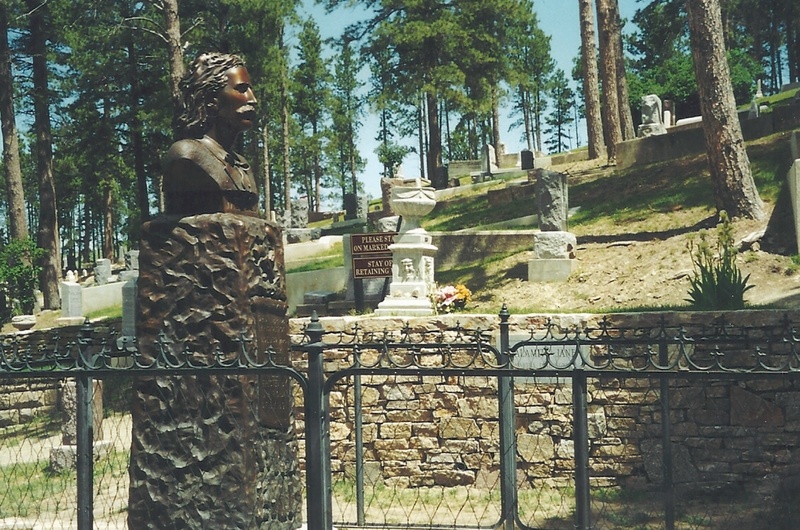 Calamity Jane is buried next to Wild Bill. Wednesday, we are off to the Corn Palace – yes, you read that right. Love the picture of the car with the hood up! Peter working to get it working and you taking pictures…….classic.